Text Analysis to Monitor Evolving Job Requirements — Kimberly Coffey, Ph.D. In the previous post, I collected data to answer this question by scraping job postings from the job board indeed.com. In this post, I use text analysis to analyze these job descriptions and highlight the skills that are most frequently mentioned. The first step is to convert our text documents, which are currently saved in a vector, to a corpus, or body of documents, for text analysis. You'll need the text mining package tm. We can then preprocess the data for the analysis. This typically involves converting all words to lowercase (so “Data” and “data” are both treated as the same word), removing numbers and punctuation, removing extremely common words that we probably don’t care about (e.g., “and”, “is”, etc. ), and removing common word endings (so “document” and “documents” are treated as the same word). Given that there are some specific two- and three-word phrases, and single-letter terms like “R” and “C”, that I want to be analyzed appropriately, I also do some manual adjustments to the data. There are other ways to do this, but I chose this method for its simplicity and clarity: it's easy for readers to see what I'm doing here. These manual adjustments are a little tricky, though, because the order of data cleaning operations can change how the terms are handled. For example, in this analysis, I want to make sure the appearance of the letter R in isolation is treated as a word (i.e., the R statistical and computing environment). To make sure it’s appearing in isolation, and not embedded in a woRd, I specify that there should be spaces on either side of the letter. To avoid concerns about whether R is appearing in a list (e.g., R, Python, etc. ), though, I strip out the punctuation before doing this… and so on. After cleaning the data, the corpus is converted into a PlainTextDocument. The analysis happens when this PlainTextDocument is then transformed into a TermDocumentMatrix. The TermDocumentMatrix features the analyzed words in rows, the documents in columns, and the counts of how many times each word appeared in the document in each cell. This matrix can easily be converted to a data frame for manipulation. Text analysis often uses basic word counts, but for our purposes, we want something a little different: to determine how in-demand different skills are, we’re probably more concerned with whether or not a given job posting mentioned the skill at all, rather than how many times it was mentioned. For example, it’s more important to know that five different job postings mentioned logistic regression than it is to know that it was mentioned once in four of them and three times in the fifth posting. For this reason, I convert the column variables from word counts to a binary variable reflecting whether or not the word was mentioned. Then I create a simple percentage variable representing the percentage of job postings that mentioned each word or phrase, sort the document in decreasing order by this percentage variable, and subset the data to look at the words and their percentages. 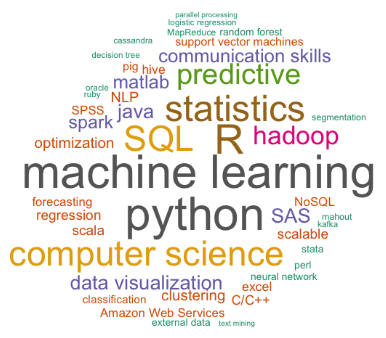 Although there’s some interesting information in here (we can see that a large percentage of job postings mention machine learning and Python), there are also a lot of other words (e.g., data, experience, work, team, etc.) that aren’t particularly helpful for our question about the knowledge base employers seek in data scientists. To filter the results, I specify some programming languages, applications, data warehousing infrastruction, data analytic techniques, and other skills and terms that are relevant and look at the results for these terms. df$word[df$word=="aws"] <- "Amazon Web Services"
df$word[df$word=="svm"] <- "support vector machines"
This creates a concise overview of the demand for various skills: we can see that 75% of job postings seek data scientists with machine learning skills, that Python is mentioned a little more than R but that they’re both the two most frequently-mentioned statistical and computing tools, and that over 50% of job postings want candidates with SQL experience. I actually find it most helpful to look at the results in a sorted table, but another common way to represent this kind of information is via a wordcloud. You can create this with the wordcloud package, as follows. This code creates the figure at the top of this blog post.